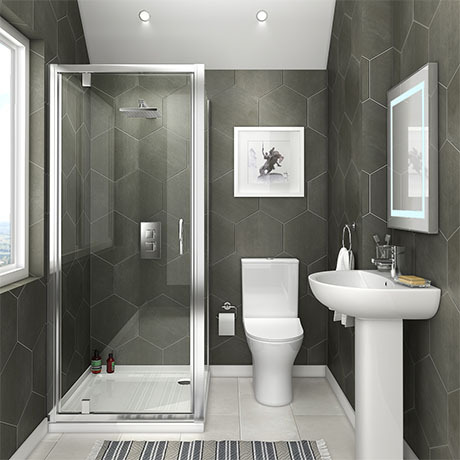 The stylish Orion space saving en-suite bathroom features quality short projection toilet and basin with a modern pivot door enclosure supplied with a white acrylic capped stone shower tray. Transform your bathroom with one of our modern designer suites, this durable bathroom suite ideal for smaller bathrooms, en-suites and cloakrooms. The Pivot Door is reversible so the door opening can be LH or RH. Please note - Tap and wastes not included.